The Chevy Chase neighborhood was designed to have a small town-suburban feel while remaining within D.C. borders. The result is a neighborhood that is remarkably clean, safe, and picturesque. You’ll find a striking blend of historic homes, buildings, and businesses, along with newer establishments in the Chevy Chase neighborhood. All of this makes for a unique, historic living experience with the comforts of modern day living. Many families and residents of D.C. tend to relocate to Chevy Chase in search of a quieter atmosphere, while still remaining close to local D.C. attractions. It has a great mix of age groups and a charming vibe. 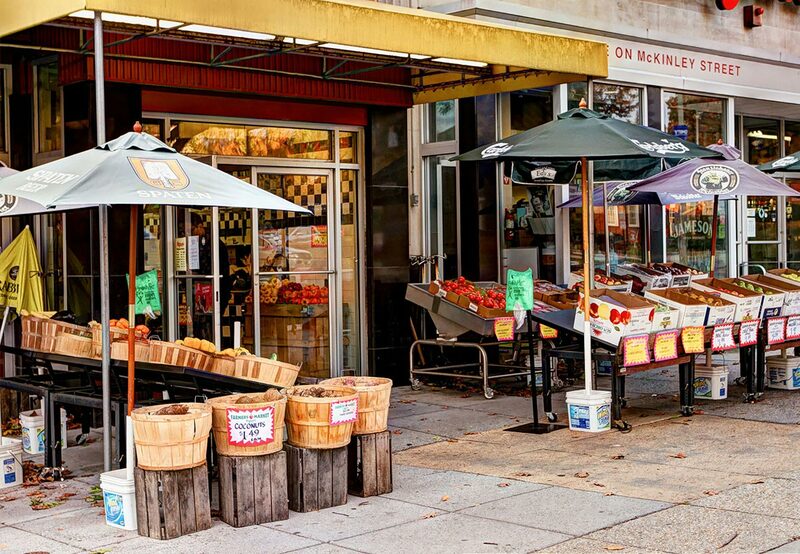 Let’s take a closer look at this iconic D.C. neighborhood! The contrast between vintage and contemporary is seen especially in the shopping options around Chevy Chase. For one, you have locally-owned businesses that have been here for decades and retain a small-town charm. Some of these businesses include Magruder’s wine store and American City Diner. These are town favorites, mostly located along Connecticut Ave., south of Chevy Chase circle. Another spot that captures the atmosphere and vibe of Chevy Chase is Terasol, a quaint Bistro and artisan gallery. Sophisticated dishes are served up, while local artisan displays and exhibits adorn the venue. For popular hangout bars, check out Blue 44 or Jake’s Boiler Room. In contrast to this strip is the Friendship Heights area, which has been developed more recently and includes higher-end shopping, such as Anthropologie and Nina McLemore. You can also find more familiar commercial establishments, such as Whole Foods and Cheesecake Factory in Chevy Chase. In this way, residents are exposed to both old-style charm and ultra-modern conveniences. As mentioned, Chevy Chase has a distinctly suburban feel to it, but it’s not just any suburb. Many residential homes are certified with plaques indicating that they’re historic homes. How cool is that! Many of these homes are built in the early 1900’s and reflect designs and architecture that are unique to early U.S. living styles. Chevy Chase has many other historic buildings and landmarks. One of the most iconic in the area is Avalon Theater, sometimes called Chevy Chase theater. Avalon was built in 1922 and is touted as being “D.C.’s only non-profit film center.” You can catch first screenings, various indie films, and even film studies at Avalon. Aside from its historical buildings and new developments, the Chevy Chase neighborhood is surrounded by lush natural scenery and beautiful parks. Of, course, there’s Rock Creek Park, a vast national park that borders Chevy Chase on the east. This preserved area is ideal for hikes, nature walks, and overall outdoor trekking. More lovely parks in Chevy Chase include Lafayette Park and Livingston Park. Lafayette has a newly renovated, state-of-the-art playground for the kiddos. Livingston is also where Chevy Chase Recreation Center is located. Livingston features a dog park, basketball courts, softball fields, and many other facilities. Chevy Chase has some of the best schools in the area. D.C. Public Schools operates the following schools: Lafayette and Murch Elementary schools (considered some of the best schools in the city), Alice Deal Middle School, and Woodrow Wilson High School. There are also several private schools to choose from, including St. John’s College High School and Blessed Sacrament. Many families migrate from downtown D.C. to Chevy Chase specifically for its outstanding educational system. Lastly, graduates who are seeking to keep their brains sharp can enjoy a book from the Chevy Chase Neighborhood Library. The Chevy Chase neighborhood has something for everyone. Whether you’re single and enjoy going out, or are looking to relocate your children and family, Chevy Chase is truly a hidden gem in the Washington D.C. area. Interested in moving into the neighborhood? Check out a luxury apartment at 5333 Connecticut. Get in touch with us today to learn about floor plans, features, amenities, and VIP services.